It's my truck, my off road vehicle, my 4-wheeler, my ragtop and everyday car all in one. It's an American icon, celebrating its 70th anniversary this year. And like so many lasting utilitarian pieces, it has roots in the military. 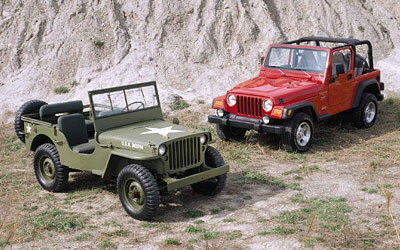 The general purpose vehicle, known as the GP and quickly dubbed "the jeep" was made for World War II. Designed by the Bantam Car Company for the US Army and produced by Willys-Overland (which would later become Jeep), the four-wheel-drive scout car was tough, fast and low to the ground. It was small, but could carry up to seven men—even the front bumper served as a seat. An M1 rifle was tucked under the folding windscreen and there was a shovel and an axe to dig yourself out of trouble. At the height of the war, the army was producing three jeeps every four minutes and by the end, we had deployed nearly 650,000 to American and ally troops. When our boys came home, they started buying surplus four-by-fours and tens of thousands were sold to civilians at government sales. Today's models are still influenced by the original, with a few plush additions like doors and power steering. But then again, they don't come with a gun or an axe.